Two fossil fuel trade associations have been ordered to retract misleading promotional claims about the climate credentials and cost-effectiveness of oil and natural gas. 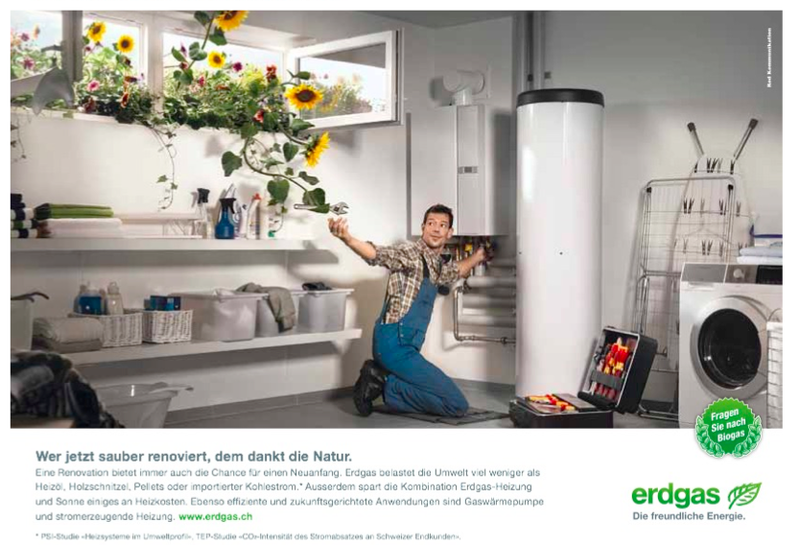 The Association of the Swiss Natural Gas Industry published advertisements – overgrown with helpful gas-lovin’ sentient sunflowers – that promoted swapping oil for natural gas as the most effective way of tackling climate change, a claim judged “inappropriate” by the Swiss communication industry’s committee for fair trade practices. The adverts, which suggest that burning natural gas is something ‘nature will thank you for’, claimed that natural gas impacts the environment less than do wood chips, pellets, or imported coal-generated electricity, which the committee has ruled it can no longer say. And promoting the substitution of natural gas for oil as the most effective climate protection measure was also found to be objectionable. Research included in the appeal against the adverts suggested that there are in fact several more climate-friendly and cost-efficient replacements for oil than natural gas, including better energy efficiency measures. Speaking of oil (which is indeed more polluting than gas), the Swiss Petroleum Association published materials describing oil heaters as the most economical path to climate protection, a claim the communication industry committee found to be ‘objectionable’. Needless to say, this isn’t the first time the fossil fuel industry has been caught misleading the public. In 2008, Shell was taken to task by the UK’s Advertising Standards Authority for using the word ‘sustainable’ in relation to its Canadian tar sands projects. Shell ran into trouble again in 2011 in South Africa for running full-page adverts in multiple newspapers that claimed fracking has never caused water contamination. In 2014, Peabody was pulled up for using the phrase ‘clean coal’ in a number of manipulative adverts intended to sell coal as the solution to energy poverty in developing countries (which, as has been shown again and again, it isn’t). Across the Atlantic and in complete contrast, North Vancouver is implementing compulsory anti-smoking-style warning stickers for fuel pumps at petrol (or ‘gas’) stations. These ads will use text and images to remind customers of the climate impact of the fuel they’re buying, in the hopes that drivers will consider their fuel consumption more carefully and perhaps drive more fuel-efficiently. Or just drive less. Do it for the moose, Canada. You can read the report submitted to the trade standards committee by Greenpeace Switzerland here (in German).